Paulina Parlange Pizarro is French/Mexican, a biologist by profession and a business owner in textiles. Her company works with indigenous women in Mexico and supports them in designing, marketing and exporting their creations, according to fair trade rules. 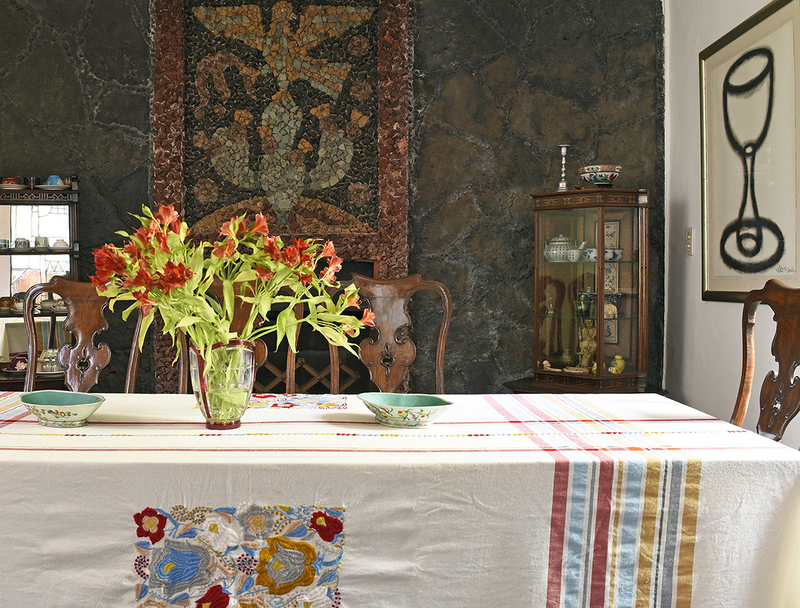 She has lived in Mexico City all her life, but has travelled around Mexico since she was very young, and believes that her interest in textiles and in theproduction of artwork for utilitarian uses started at an early age through these travels. 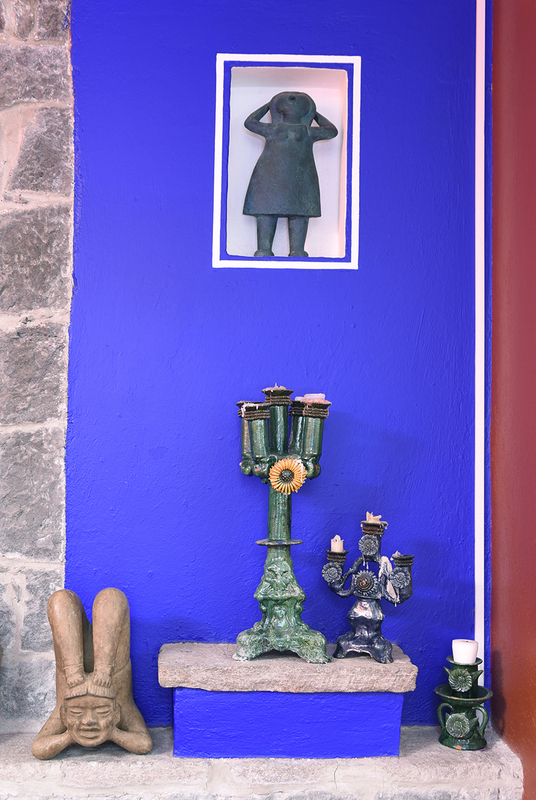 Paulina lives in the former home of Juan O’Gorman, the Irish/Mexican artist and architect, famous for his murals and mosaics. His most well known work is the UNAM University Library of Mexico City, and the Bank of Mexico. The façade of the Library is covered in mosaics of natural stones with motifs of the Mexican people’s history. 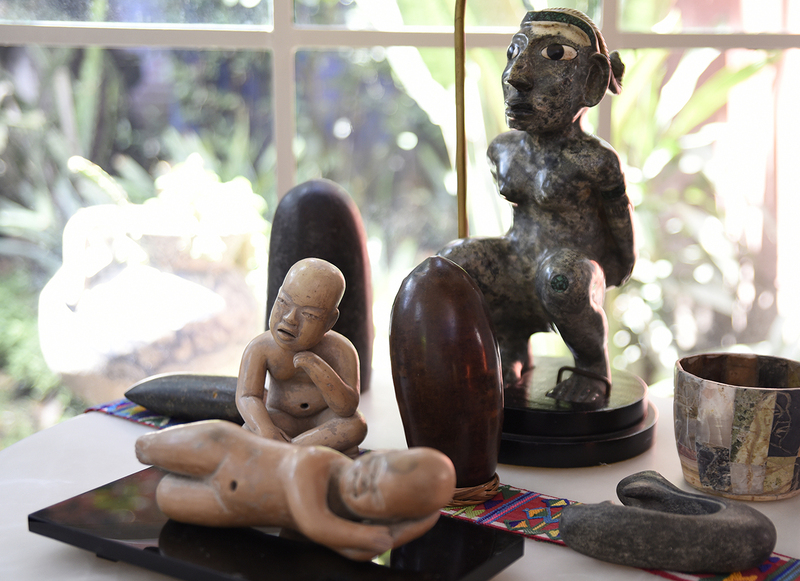 Very different are the houses he designed for his friends, Diego Rivera and Frida Kahlo, just two streets away. These buildings, from 1933, are in a functionalist style people called brutalist-functionalism at the time. They were the very first of their kind in the city and were very controversial. He had first designed and built this very house in the same functionalist style, originally for his father but it was later to become his own home. The living room has a ceiling height of nearly six metres. It has a stunning floor-to-ceiling window that takes in the greenery of the garden and the adjoining blocks of blood red and cobalt blue on the different parts of the buildings that make up the house. This large room was built on the existing house and where Juan O’Gorman had his studio. And it’s here that Paulina spends the most of her time. Our conversation takes an unexpected turn when she points out of the window and tells me: “He hanged himself out there in that tree!” It turned out that O’Gorman committed suicide in 1982 at the age of 76, with great drama as he hanged, shot and poisoned himself at the same time. More amazing still, it turns out that Juan O’Gorman’s spirit is still present in this home. The old gardener was the one who told her this and that he still had conversations with him frequently. And it happens from time to time that people who visit her claim to have seen or perceived him. A friend, a female doctor who was visiting, asked her when she was coming back from visiting the bathroom: “Is that your grandfather?” “Who?” Paulina wondered. “The old man that’s in the studio,” she replied. “My friend became frightened after this, because it was the second time in her life that she had seen a deceased person,” Paulina says.